Cast iron skillets rate highly with both novice chefs and professionals, but which pan is the right one for your particular needs? It can be difficult to navigate through the wide range of skillets available on the market, and even more difficult to differentiate between them. Although cast iron cookware is popular as a whole, not all skillets are the same, with different seasonings, sizes and features to consider. Our overall top pick is the 12″ cast iron skillet by Victoria. However, in this guide we review five of the best cast iron skillets on the market, outlining their benefits and downsides. 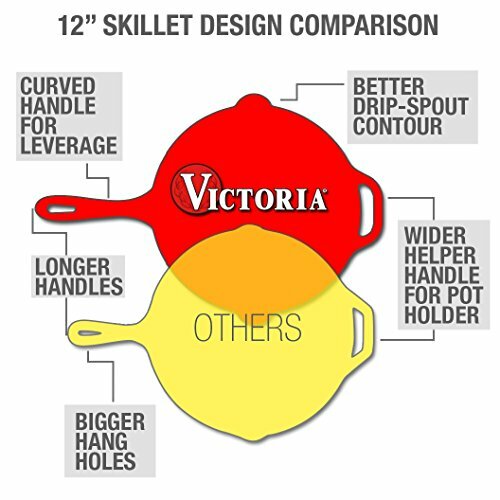 Read on to find out what skillet is the best for your kitchen or campfire. If you decide that you need more than just a skillet, check out our best cast iron cookware guide for more comparisons and buying options. 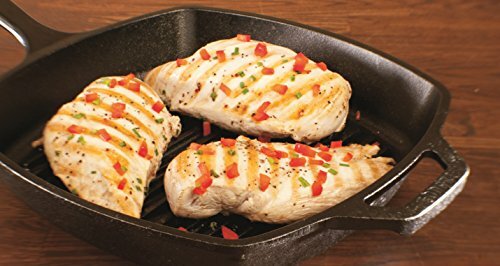 What Size Cast Iron Skillet Should I Buy? Are Cast Iron Pans Non-Stick? Can Cast Iron Skillets Go In The Oven? Will Cast Iron Work On Induction? This enameled 11 ¾-inch skillet weighs a hefty 4.5 pounds and features a long handle for maneuvering the pot over the burner, and a short handle for hanging. While the exterior is coated in colored enamel, which is available in a variety of hues, the interior is coated in black enamel and requires no extra seasoning. The looped helper handle on this pan is super, it helps balance the heft of the cast iron, making it simple to move from stove top to oven, to kitchen counter. Pouring is also a breeze, with a pour spout on either side to facilitate drip-free pouring. It’s important to heat this pan slowly to keep your foods from sticking. Per the Le Creuset instructions, you’ll want to heat the pan, add the oil, and then add your non-acidic and dry foods. Too much water can cause sticking and will compromise the temperature of your oil. As noted in our Le Creuset reviews, although it is purported to be dishwasher safe, users have noticed that the seasoning is compromised with this method, so it’s best to stick to a gentle hand wash and swipe some vegetable oil around the base before storing your pan. This skillet by Victoria is a 12-inch round pan which features a curved helper handle and specially designed pour spouts to reduce drips. It comes pre-seasoned with 100% organic flaxseed oil and weighs only 6.7 pounds. Versatility is synonymous with this pan, which can be used with induction or ceramic ovens, campfires, grills and more. The pour spouts are contoured to catch drips, making for easy clean-up and less mess from spillage. Not only are these pans durable, they are also super stylish, with the curved handles providing a unique look and style. The flared sides make them ideal for steaks or chicken breasts, but may lead to spattering and spills if you plan to deep fry or cook something very greasy, such as bacon. Victoria create traditional cast iron skillets with just the right mix of modern-thinking added, like the ergonomic curved handles for easy maneuverability and contoured pouring spouts. If you’re looking for a versatile, lighter-weight and well-seasoned pan that can last a lifetime with proper care, the 12″ cast iron skillet by Victoria is a great pick. This 6.5 pound, 10.5-inch square pan features a long handle for maneuvering and a short handle for balancing the extra weight and hanging on display. It has raised or “ribbed” grill bars and comes pre-seasoned, ready for use. The raised grill bars hold heat well and give your food a great “char” no matter the season, while also allowing excess fat and oil to drip away from your cooking. Although heavy, the handles help move it easily from stove top to oven, or even outdoors to a fire pit or your charcoal grill. Great for cooks who love to create slow-cook recipes or sear meat, whether at home or over a campfire. As with most cast iron, it’s designed to last the distance, so well worth making the investment in this quality skillet that will last for generations. People who love to grill will enjoy this pan, which can deliver premium grilled food right from your stovetop during winter, or over the campfire in summer. This 12.5-inch skillet by Utopia Kitchen comes pre-seasoned with vegetable oil, meaning you can take it out of the box and straight into the kitchen. The diameter is wide enough to cook anything you can think of – it’s big enough to accommodate three grilled cheese sandwiches in one go. The size also allows it to fit onto any heat source, from gas tops to ceramic-glass stoves. The extra grip handle provides a bit of security, giving you the confidence to safely move heavier meals around the kitchen. All cast iron is susceptible to rust, but as this iron is more porous, it will be more susceptible to moisture. Make sure to dry this pan with heat, not cloth or paper towels, and pay extra attention to seasoning it often and well, as the pre-seasoning doesn’t hold up as well as promised. Once you master the art of seasoning and maintenance, the Utopia Kitchen cast iron pan does a great job. 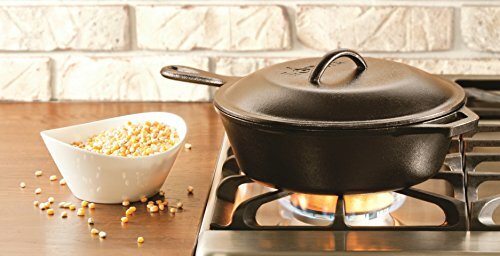 Ideal for cooks who love the old-school style and quality of cooking with cast iron, this pan is well suited for crafting delicious corn bread over a campfire. If you are a bit lazy when it comes to seasoning, you’re better off going with a different style of pan. Weighing nearly 11 pounds, this 3-quart capacity, 10 1/4 -inch piece is a solid kitchen beast. It comes with a snug fitting lid, stout helper handle and long handle. Your Lodge cast iron frying pan is sand cast, rather than die cast, and comes to you pre-seasoned. What this means is that the pan has a slightly pebbled surface inside and outside. This reduces the risk of sticking and helps maintain the seasoned coating. A nice added feature are the tiny divots on the bottom of the lid which capture moisture and drip it back into the pot, producing juicy and tender cuts of meat. Although the weight of this pot is one of its assets, it may be too heavy to handle for those with less arm strength. Unless you are after the added bonus of a workout when cooking, you may need to seek out something a bit less hefty. Although this pot is the perfect kitchen tool for lovers of crisp, golden fried chicken, it’s great with pretty much everything, and the added depth is ideal for creating one-pot meals. It’s heaviness may put some users off, but the weight does makes this a sturdy and durable addition to any kitchen. The answer to this question is as varied as the amount of dishes you can create using your skillet! An important factor to consider is that cast iron is heavy. If you aren’t overly strong or want to be tossing the pan around, you should choose something close to a 10-inch pan, but bear in mind you’ll be sacrificing some depth and width. If you’re cooking for one or two, you can safely choose an 8″ to 10-inch model, but for anything more than that, you’re better off with the larger 12-inch. For reference, a 10-inch pan will probably struggle to fit two cuts of steak or two grilled cheese sandwiches, whereas a 12-inch skillet can handle a whole chicken. The short answer to this question is no, cast iron is not technically non-stick as you would find in modern, Teflon coated pans. See our best nonstick cookware buyer’s guide for more details. However, it does have the ability to be seasoned. Seasoning is the process where baked on oils create a slick film, creating a protective non-stick layer. 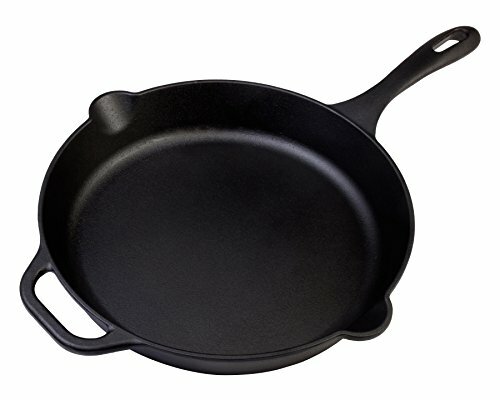 Cast iron pans require a little more care than other pans, and you should always refer to manufacturer’s instructions to find the best technique for your purchase. Generally, you should avoid cleaning your cast iron pan with soap, and refrain from using metal utensils with it. Most of the pans reviewed above come pre-seasoned, but every brand varies in the oils used and method of seasoning, so they are not all created equal. The beauty of cast iron is its versatility. It can be used in so many different situations, from campfires and outdoor grills to stovetops and ovens. Cast iron can withstand extremely high temperatures – in fact, its melting point is over 2200 degrees F, so it is virtually indestructible in your kitchen oven. However, at temperatures over 400F, you may do some damage to your carefully prepped seasoning. The exception to this is if your skillet is coated with enamel, in which case you will want to keep the temperature under 400F. If your skillet has plastic handles or knobs, you can wrap them with tinfoil and still use it in the oven. The one thing you need to be careful with is sudden temperature changes. Never toss your skillet straight from the heat into cold water, this can cause it to crack. As opposed to glass or some stainless steel blends, cast iron is ideal for use on this type of stovetop. However, the best pan for use with induction is a magnetic aluminum version, which conducts heat quickly and evenly. Cast iron does not conduct heat so well, so may take a little longer to heat up, but it will stay hotter for longer. Induction ovens use magnetic induction, not thermal induction, to create heat, causing rapid temperature increases. See our induction cooktop reviews for more details. Basically the stovetop uses the magnetic field travelling between your cookware and the copper coil in the stove to create heat. A quick way to know if your cookware is compatible with induction ovens is to see if a magnet will stick to the bottom. If it does stick strongly, you’re good to go (induction cooktop vs electric). Yes, there is the potential for your heavy iron cookware to scratch the glass surface of an induction stovetop. If you’re concerned about scratching you may be interested in our best induction cookware guide to help you find safer options. However, that doesn’t mean you can’t use cast iron with induction ovens. It’s as simple as placing something thin between your skillet and cooking surface. People commonly use paper towels or even newspaper. Using paper also helps keep your cooktop free of splatters, making cleaning fast and easy. Because induction ovens use magnetic fields, the surface of the cooktop doesn’t actually heat up, so the paper shouldn’t burn. Do keep an eye on it though, as the pan itself will still heat. Silicon baking sheets are also effective at preventing scratches. People who use cast iron skillets swear by them, for good reason. The history of cast iron cookware has shown that these pans are durable, versatile, sturdy and attractive. 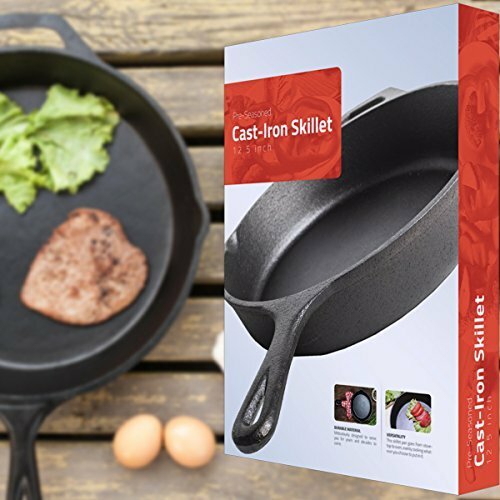 You really can’t go wrong with cast iron, it’s just a matter of choosing the right size skillet you need and considering the weight and extra features on offer. The 12-inch pre-seasoned cast iron skillet by Victoria is an excellent choice for those looking for a traditional pan. Victoria strikes the right balance with their combination of old school cast-iron durability and some added modern features that make handling and cleanup a breeze.